WASHINGTON — A top adviser to President Donald Trump has urged the defeat of a Michigan congressman and member of a conservative group of U.S. House lawmakers who derailed the White House on legislation to repeal and replace the Obama-era health care law. 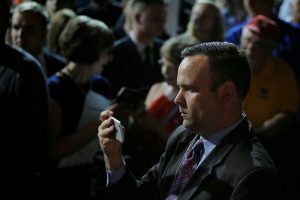 Government ethics lawyers said the tweet by White House social media director Dan Scavino Jr. violated federal law that limits political activity by government employees. The White House denied Scavino had run afoul of the law. Two days after Trump himself tweeted a threat to the conservative House Freedom Caucus, a group of fellow Republicans, Scavino followed up Saturday by singling out Rep. Justin Amash, R-Mich., for criticism and urging Trump supporters to defeat the congressman in next year’s primary election. Ethics lawyers who worked for both Republican and Democratic presidents said Scavino violated the Hatch Act, a federal law that limits political activity by government employees. They said it didn’t matter that Scavino tweeted from an account marked as “personal” and not from his official government Twitter account. De facto means that if you tweet only about WH work from your account, it's an official account. Labeling "personal" doesn't change that. House Freedom Caucus members helped derail a vote last month on legislation long sought by Republicans to repeal and replace the health care law known as Obamacare. Its members argued that the bill didn’t go far enough to undo the law. Some moderate Republicans also objected to the legislation, but for different reasons.